I really started missing advanced features for managing my bookmarks, so I started looking for some plugins, helping me with this. Turns out I need more RAM. Chromium is incredibly fast, but with many tabs a freakingÂ resourceÂ killer, at least more RAM consuming than Firefox. A great thing I have not mentioned yet, is that the extensions work on the fly. You don’t have to restart your browser to make them work if you just installed them. Novell Moonlight a Silverlight implementation that just kept crashing on me. I’ve found some forums where similar problems on ubuntu appear, but I’ve been to lazy so far. I’ve only played around a bit with Chrome and Chromium so far, so I wanted a closer look at the browser. I always did miss things that I had in Firefox, but as I like to give new things a chance (and can’t stand no changes :D) I managed to dig up some plugins so Chromium would fit my needs. So let’s see how it compares to Firefox. For Windows users, have a look at the daily trunk for W32 builds. 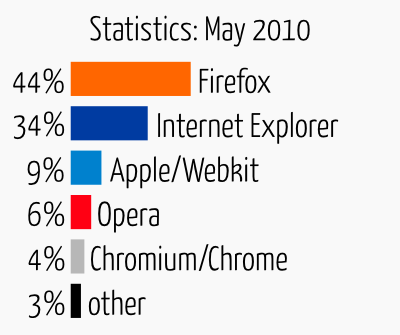 Let’s face it, most people don’t know what a browser is. They just click some icon and call this the internet. The problem about these people is, they are potential users of old browsers, which puts web developers in a difficult situation. 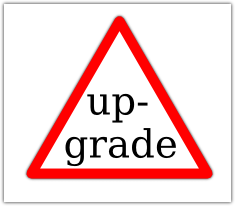 They have to do twice the work or choose old technologies over new ones, even if the new technology or way of doing things would be based on standards, more time and bandwidth, CPU-workload efficient or just give the user better ways of interaction. So it seems like a good idea to notice visitors, if they are using old software that might interfere with correct use of your website. A nice script, which automatically detects browser and language for that can be found at http://browser-update.org/. It’s java-script based and shows a little notification bar on top of your website, that will notify visitors that use outdated software.